Abstract: Upper Jurassic limestones exposed in four selected successions of the Western Dinarides show contemporaneous but different facies development within the Western Dinaric region, which belongs to the marginal and northwestern part of the large Upper Triassic-to-Upper Cretaceous Adriatic-Dinaric carbonate platform. In the framework of global tectonic movements in the Tethyan Realm during the Late Jurassic, block-faulting on the northeastern margin of the Adriatic-Dinaric carbonate platform significantly affected platform interior, through differential synsedimentary tectonic movements: uplifts and tiltings culminating in sporadical emersions, and simultaneous increased subsidences, with the formation of intraplatform troughs connected to the open sea. Thus, block-faulting initiated changes in accommodation space within the inner platform realm and acted as an indirect impulse for autocyclic processes to take place both in the shallow-water and/or deeper-water platform environments. Abstract: In this study, stable C and O isotope compositions of bulk rock samples from Barremian-Aptian platform carbonates of the Taurides, the Pontides, and of their pelagic counterparts of the Sakarya continent in Turkey were measured for the first time. Platform carbonates and pelagic successions including a prominent black shale interval are composed of distinct sedimentary cycles in the form of meter-scale shallowing- upward sequences and limestone-marl/shale couplets, respectively. The biostratigraphy and the δ13C values allow this black shale interval to be correlated with the "Selli level". Variations in lithofacies and δ13C and δ18O values with the magnitudes of about 2 ‰ within the cycles indicate high frequency fluctuations in sea level, probably in response to alternate periods of cooling and warming occurring on Milankovitch-cycle scales even during the greenhouse-type Cretaceous. A good overall correlation between sedimentary cyclicity and variations in δ18O values suggests preservation of the primary isotopic signal. Abstract: Comparatively common lateral arm plates from Turonian strata in the Czech Republic are assigned to the amphiurid brittlestar species Amphiura? plana Kutscher et Jagt in Jagt, 2000, which is also known from the Campanian and Maastrichtian of northern Germany, southern Sweden, Denmark, the Netherlands and Belgium. This species appears to represent an evolutionarily conservative lineage with extensive paleogeographical and stratigraphic ranges, in excess of 20 or 25 million years. The abundance of Amphiura? plana, based on lateral arm plates, amounts to about 5 % at Velim, where three other species are commoner still. Abstract: Paleogene intrusive (tonalite, diorite) and volcanic (andesite, dacite) rocks have been identified in drilling cores from the Zala Basin, SW-Hungary. The age of these rocks has been considered to be Eocene on the basis of the observation that volcanic rocks are intimately interlayered with sedimentary rocks deposited during Nannoplankton Zone 15/16–18. However, new K/Ar data measured on mineral concentrates (amphibole, biotite, plagioclase) from intrusive and volcanic rocks yielded ages from 28.6±1.8 Ma to 33.9±1.4 Ma and from 26.0±1.2 Ma to 34.9±1.4 Ma, respectively. The Early Oligocene K/Ar age of the andesite and dacite studied contradicts the previous biostratigraphic interpretations. Furthermore, detailed petrographic study of the volcanic rocks and XRD analyses of the Eocene marl deposits are not consistent with simultaneous volcanic activity and sediment deposition. Alternatively, we propose that the volcanic rocks were emplaced as dykes into the Eocene marl during the Early Oligocene. However, an Eocene age of some explosive (mostly tuffaceous) rocks is not debated. The Early Oligocene K/Ar data of the intrusive bodies coincide with the age of other Paleogene tonalitic massives along the Periadriatic Lineament. The geochemical and radiometric age data clearly demonstrate the Alpine connection of the either intrusive or volcanic rocks studied. During the Paleogene the intrusive and volcanic rocks dislocated and as a result of the escape of the ALCAPA (Alpine-Carpathian-Pannonian) block from the Alpine realm they reached their present-day juxtaposed setting in the Early Miocene. Abstract: The Miocene sedimentation in the "Sardinia Trough" has been controlled by tectonic activity, also responsible for strong, basic-intermediate and silicic calc-alkaline volcanism. The volcano-sedimentary succession cropping out near the Villanovaforru village ("Marmilla Basin", central-southern "Sardinia Trough") is the object of this study. The succession has been subdivided into nine new stratigraphic intervals and it is characterized by abundant volcaniclastic materials. In the lower part of the succession some basaltic pillow lavas are interbedded. The nine stratigraphic intervals extend from Early Burdigalian (Zone N5 and N6) to Late Burdigalian (Zone N7) and the microfossil assemblages indicate hemipelagic sedimentation. A deepening of the basin seems to occur in correspondence to the beginning of the volcanic activity. The reconstructed stratigraphic succession of the Villanovaforru area, which is considered representative of the Early Miocene sedimentation within the southern sector of the "Marmilla Basin", shows that a transition from a continental to a marine environment occurred during the "Sardinia Trough" rifting and the drift of the Sardinia-Corsica Block. The extensional tectonics is also confirmed by the high-Mg composition of the basaltic lava flows interbedded in the succession. Abstract: The fossil record from three sphagnum peat bogs situated at altitudes of 1400–1550 m in the Central Sredna Gora Mts (Bulgaria), consisting of 115 Diatomaceea species, 15 varieties and 2 forms, represents four diatom zones covering the time span of the last 10 ky. The diatom flora in the peat bogs emerged 8 ky ago. The fluctuating development of diatom communities was controlled by unstable water level, affected by local humidity and other climatic changes. 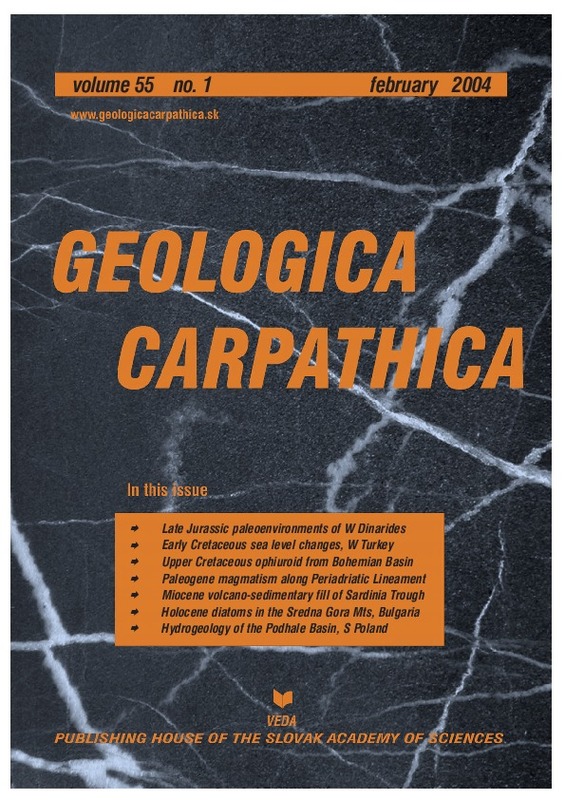 Abstract: The paper presents an analysis of the variability in fissuring with depth in the flysch deposits of the Podhale Basin (Central Western Carpathians). Within the stratigraphic sequence of the Podhale Flysch of nearly 3000 m, a fractured and permeable 80–100 m thick, near-surface zone is very important for the water flow. The thickness of this zone varies and depends mainly on the lithologic development of the flysch deposits and on their morphological position. In the shaly Szaflary and Zakopane Beds (and also in the beds from Brzegi) its thickness reaches only 50 m, while in the Chocholów Beds, where sandstone predominates, it reaches 100 m. The obtained results are comparable to the regional statistical evaluation of data from the Outer Western Carpathians.